In this review, we tackled the capabilities of Dell Inspiron 15 5000. The machine will appeal to everyone who is after an ultra-portable laptop that will run smooth. However, if you want to get to know more about this champ, continue reading through this review to decide whether this laptop meets your requirements or not. Our review covers all the most important features regarding laptop’s design, components, and performance. We ensured to be detailed, to compile the most valuable and accurate information. Read on! If the outside appearance of the machine is of critical importance to you, we’ll agree that Inspiron 15 5000 is a looker, although quite typical for the laptops of this price range. The 15.6-inch laptop houses an industrial-silver case with black accents to contribute to its elegance. Nevertheless, if you find the regular silver covering of portable machines such as laptops dull and boring, Dell.com has ensured to allow its customers to choose a different set of colors, including red, blue, and gold. The black, elegant color, flatters the upper part of the lid, where Dell’s logo is etched in the middle of the laptop. Furthermore, the laptop is equipped with a lovely gritty texture which allows it to be easy to pick up and carry around with yourself. As we open the deck, we are greeted with a dark gray coating which feels sweet and tender to touch, which will handle convenient for those who spend a lot of time with their laptops and need a convenient, soft surface to rest their palms on. When it comes to the screen, as mentioned, the 15.6-inch display hosts 1920 x 1080 pixel resolution and is surrounded with black bezel which is less thick compared to its smaller sibling Dell Inspiron 13 5000. It’s noticeable that the newer generations of laptops are adjusting to the smaller bezel policy and are tending to eliminate it, similarly to the smartphone industry nearly. When it comes to the ergonomics, we noticed that Dell Inspiron 15 5000 is heavier compared to the other laptops of the same range at 5.4 pounds. Although it shouldn’t be a pain to carry in public, it’s recommended to get a thick and comfortable bag. The laptop measures 14.9 x 10.25 x 0.94 inches which makes it slightly smaller than its rivals. 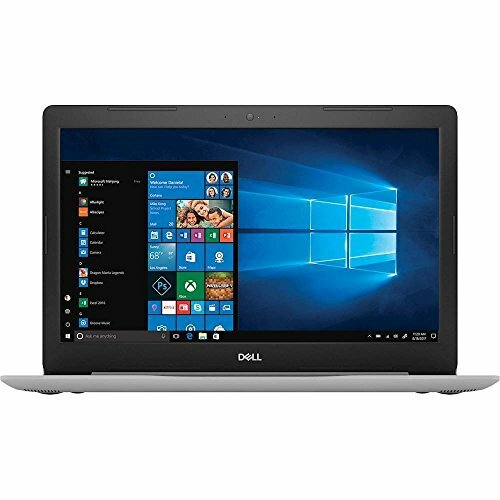 Dell Inspiron 15 5000 has to offer a large variety of ports and can provide a lot of flexibility for the daily use of multimedia and other gadgets. Observed from the left, Inspiron 15 5000 offers power port, Ethernet jack, HDMI out port, USB 3.0 port and an SD card reader. On the other side, we’re greeted with the audio jack (headphone and microphone combo jack), two USB 2.0 ports and an optical Drive. The laptop also features a Kensington lock slot. As is the case with the large variety of laptop’s screen, the 15.6-inch screen of Inspiron 15 5000 didn’t suffice, similarly to its sibling Inspiron 13. The reason for that is that the screen is dim and hard to look at unless the brightness is put to 100%. When it comes to the colors, the Inspiron 15 colors are bland and don’t feel as vibrant as on the competing laptops. Furthermore, they don’t feel accurate, so when you watch trailers and other types of videos, it’ll feel like the colors are washed out and hardly accurate. The resolution is quite disappointing as well. Many laptops with 15.6-inch don’t always come with full HD resolution, while the same price-range offers 1920 x 1080 pixel resolution for Inspiron 15 5000. The panel, compared to its predecessor, is replaced with a weaker one, offering less accuracy and details on people’s appearance on the videos. Not even the brightest colors hit the premium. Alike to its sibling, the keyboard is stiff and shallow. It only offers 1.3 mm of travel time, which can cause pain to those looking for a deep and comfy keyboard that has a bouncy tactile response. In order to complete a full press on a keyboard, users need to apply the force of strong 70 grams. They bottom quite easy and painfully. Nevertheless, as mentioned above, the palm rests are incredibly soft and comfortable, so your hands won’t get tired even after hours of typing. While using the keyboard, thanks to its stiffness and poor line spacing, you will notice yourself making errors. Although I’m a slower typist, I noticed I typed even slower while testing the typing speed on the 10fastfingers.com. Dell delivers good news assuring you that the keyboard is spill-proof. No more damaged keyboard after spilling soda. Of course, keep in mind that the keyboard will stop small amounts of liquid and might not respond properly to large amounts of the spill on the keyboard. If you use Microsoft Office programs, you will be thrilled that the laptop features a full-numeric pad on the right side of the keyboard, which many laptops of the same price-range don’t offer. On the other hand, Dell Inspiron 15 5000 is equipped with a touchpad with a satisfying response. The 4.1 x 3.1 inches touchpad is sufficiently large to offer enough room for multi-touch gestures and offers convenience and accuracy when using, nearly as much as a real mouse. You can use multi-touch gestures to clear the desktop, give demands to Cortana and even scrolling the social networks with two fingers. Furthermore, the touchpad feels smooth on touch and enjoyable while it’s gliding. Audio of Inspiron 15 5000 feels much better compared to other features on the mentioned laptop. While on the desk, regardless of the gender, laptop provided crisp and clear output. The vocals in songs were deep and accurate, even though the mids weren’t as prominent as originally thought. When we decided to place the laptop in the lap, or any other, less firm surface, the audio quality decreased, the sound wasn’t as crisp and instead, the vocals were not as clear and stellar. Dell provided its Dell Audio software for users to calibrate speakers and set them in a way that would suit them. There are even profiles such as MaxxSense, which proved itself to be the best in the crowd. While the design was quite firm and even slightly original on Dell Inspiron 15 5000, compared to Inspiron 13 5000, the features weren’t as impressive, and that’s why we give it 3 out of 5. The 2018 model of Dell Inspiron 15 5000, aside from the touchscreen is equipped with many more new components. The processor is Intel Core i5-8250U which can boost up to 3.4 GHz of performance in the turbo mode. Along the line, there is 8 GB of RAM which is more than sufficient in running high-end applications without hiccups. When it comes to the graphics chipset, there is Intel HD Graphics 620 with shared memory. This is not a gaming laptop, so you won’t see yourself running high-end titles, although the laptop should perform adequately with some older and less demanding titles with this graphics setup. For the storage, there is a 256GB SSD, which is a change compared to the older model which was equipped with a 1TB mechanical hard drive. However, the 256GB SSD is slightly slow for its performance, taking quite some time to transfer the necessary data. If you store a lot of data, make sure to get an additional external hard-drive. Dell Inspiron 15 5000 proved itself pretty impressive when it comes to battery life. In our battery test which included continuous web surfing and streaming videos allowed the laptop to last 6 hours and 30 minutes which is quite impressive for a 15.6 inches laptop. The laptop is far from too hot to handle. In a test which included 20 minutes video streaming, the laptop was barely warm. The touchpad was 75 degrees Fahrenheit, while the keyboard hit 83 degrees Fahrenheit. Given that the bottom of the laptop measured 90 degrees, which was still below 95 thresholds, we give that the laptop has amazing thermal protection. We were quite impressed with the performance of Inspiron 15 5000, so we give it 5 out of 5. The laptop is priced relatively $1,300.00 which is more than a decent price with these capabilities. Although keyboard and screen could be better, you won’t find any better quality in the similar price range. The laptop earned 4 out of 5 stars. Priced at $1,300.00, Dell Inspiron 15 5000 is a 15.6-inch ultrabook which is relatively adequate for carrying. It is equipped with a hard keyboard, dim screen, and respectably stellar audio. Its performance is beyond its class if we don’t mention the slightly slow SSD. When it comes to heating and battery, Inspiron 15 5000 provided more than satisfactory experience. If you are looking a sub-$800 multi-purpose laptop, search no further than Dell Inspiron 15 5000. It is equipped with a great variety of features, and although some of them don’t excel at its performance, the laptop, in-whole will satisfy some of the most demanding users on a mainstream laptop. Priced at $749, Dell Inspiron 15 5000 is a 15.6-inch ultrabook which is relatively adequate for carrying. It is equipped with a hard keyboard, dim screen, and respectably stellar audio. Its performance is beyond its class if we don’t mention the slightly slow SSD. When it comes to heating and battery, Inspiron 15 5000 provided more than satisfactory experience.